Elegant, classic and timeless – just a few words that sum up the artistry of wrought iron and the impact it has on homes and businesses around the world. Whether it’s a bespoke railing, classic garden fence or grand entrance gate, wrought iron brings a sought-after appeal to any property. But have you ever wondered how blacksmiths work with wrought iron? First, let’s start with the basics. Blacksmiths are professionals who create objects from steel or wrought iron by forging the metal using tools to hammer, bend and cut. While there many people who work with metal, blacksmiths have a general knowledge of how to make and repair many things, from gates, fences and railings to security doors, furniture and decorative items. Where Did the Term Blacksmith Come From? In the history of the blacksmith, the word ‘black’ in ‘blacksmith’ refers to the black fire scale, which is the layer of oxides that forms on the surface of metal during heating. The origin of the word ‘smith’ is debatable, however, it may come from the old English word ‘smythe’ which means ‘to strike’, or from the German word ‘smithaz’, which means ‘skilled worker’. Blacksmiths work by heating pieces of steel or wrought iron in a forge (a fire or furnace) until it’s soft enough to shape with tools such as a chisel, anvil or hammer. Colour is important for indicating the metal’s temperature and its workability, and as the iron heats to higher temperatures, it glows – first red, then orange, then yellow and finally white. 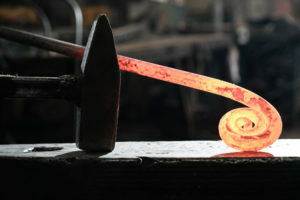 The ideal heat for the majority of forging is the bright yellow-orange colour that indicates ‘forging heat’, and blacksmiths often work inconsistent lighting, as direct sunlight obscures the colours. The technique of ‘smithing’ can be roughly divided into the processes of forging, welding, heat-treating and then finishing. Forging is the process of ironwork that blacksmiths use to shape metal by hammering it into shape. This process generally requires at least a hammer and an anvil, but ‘smithies’ also use other more modern methods depending on the end results they are looking to achieve. #1 Drawing down – the process of lengthening the metal by reducing one or both of the other two dimensions in terms of depth and width. As the width is narrowed or the depth reduced, the piece is ‘drawn out’ or lengthened. For example, if a smith is making a chisel, they may flatten a square bar of steel and lengthen the metal but reduce its depth so that the width is kept consistent. #2 Upsetting – the process of making metal thicker in one dimension by shortening it in another. One form of upsetting is to heat the end of a metal rod and then hammer it like you would a nail – the rod gets shorter and the hot part widens. #3 Bending – the process of heating iron to ‘forging heat’ level. It can be done with a hammer over the ‘horn’ or edge of an anvil, or by inserting a bending ‘fork’ into the Hardy Hole (which is the hole in the top of the anvil), placing the metal between the tines of the fork and then bending the material to the desired angle. #4 Punching – done to make a hole or create a decorative pattern. For example, to make a hammerhead, a smith would punch a hole in a heavy rod in order to incorporate the hammer handle. Welding is the process of joining the same or similar kinds of metal together, and in forge- welding the pieces are heated to what is referred to as ‘welding heat’. This is normally judged by colour – the metal or wrought iron glows an intense yellow or white, and at this temperature, it is near molten (liquefied by heat) inconsistency. Any oxides (known as ‘scale’) in the weld that typically form in a fire can weaken it and cause it to fail, so a smithy must make sure the two surfaces that are coming together are kept ‘clean’. They do this by making sure the fire is a ‘reducing’ fire, which is a fire whose heart has a great deal of heat and little oxygen. A smithy will commonly place the metal in the fire so they can see it and not let the surrounding air contact the surface. This is because if they remove it from the fire it will be exposed to air, which can rapidly oxidize it and weaken the material. When the metal is ready, the smithy will quickly take the metal from the fire to the anvil and bring the ‘faces’ of the metal objects together. They will then reheat the joint to welding temperature and work to ‘set’ it and finally dress it to shape. Depending on the intended use of the final piece, a smithy may finish it in a number of ways. They may use tools to smooth and polish surfaces, heat-treat it to harden it, or use finishes and treatments to inhibit oxidation or change the piece’s appearance. These can include finishing with paint, varnish, oil and wax. Would you like to know more about wrought iron products? Wrought iron supplier Dean-Wilson Iron was established over 20 years ago by blacksmiths Joel Dean and Andrew Wilson. As one of the premier blacksmiths in Brisbane and across the state, they produce a range of hand-forged wrought iron products and are proud to be known as the premium choice for bespoke iron artistry in Queensland. After a unique bespoke wrought iron piece for your home? Contact the experts at Dean-Wilson Iron on 3814 0076.